Former England and Wales Cricket Board chairman David Morgan has been nominated to become the next president of Marylebone Cricket Club (MCC). Ex-International Cricket Council (ICC) president Morgan, who is currently in a similar post at Glamorgan, was unveiled at the MCC's annual meeting at Lord's. Morgan, 76, accepted his nomination by outgoing MCC president Mike Gatting. The Welshman will take up the post on 1 October 2014. The MCC remain the guardians of the laws of the game and uphold the spirit of cricket. "David Morgan has been and remains one of the most influential voices in the world game," said ex-England captain Gatting. "I'm sure he will do an excellent job in leading MCC through a very important time in its history. "He is ambitious, creative and efficient and will be a fantastic leader for this wonderful club." Morgan spent four years as Glamorgan chairman between 1993 and 1997, succeeding former MCC president Tony Lewis at the Welsh county. 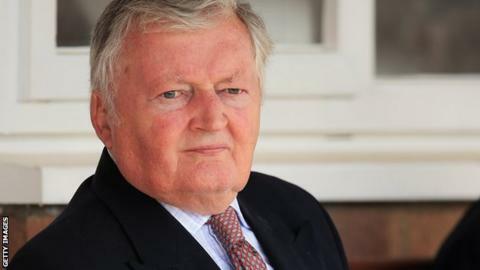 He went on to work as Lord MacLaurin's deputy at the ECB until 2002, when he was elected to take on the chairmanship himself. After five years with the ECB, Morgan was nominated for presidency of the ICC for a two-year term, being succeeded by Sharad Pawar in 2010. His most recent contribution to English cricket was the Morgan Review of 2011, which was considered to be the biggest shake-up of the county game in a decade. The report's recommendations were implemented prior to the start of the 2014 season. In 2008, Morgan was appointed OBE for his services to cricket.